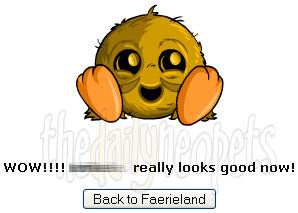 One of the most wanted things in all of Neopia that you cannot buy is a Fountain Faerie Quest. 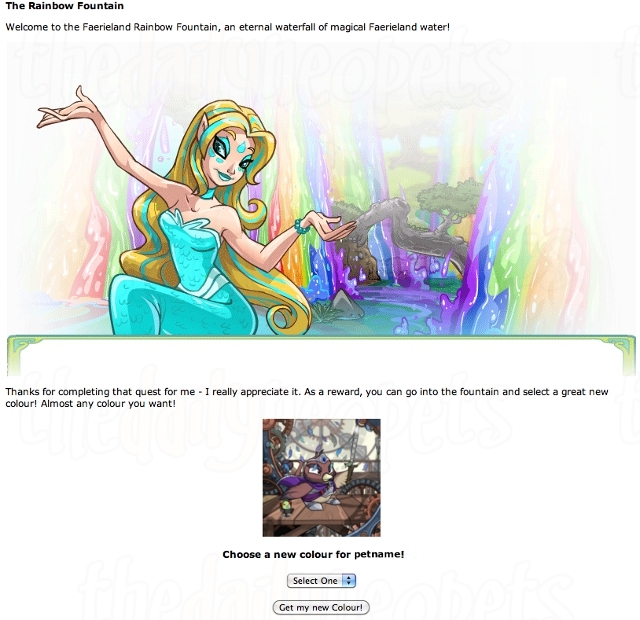 By completing a Fountain Faerie Quest, you get to choose one of your pets to be painted any (see the few exceptions below) color you want, essentially for FREE. Yes, I did just say free, the exception being that you do of course have to pay for the quest item. Below are the steps and the entire process of a Fountain Faerie Quest. What to do when you get a Fountain Faerie Quest? One of the easiest methods to use. Since you perform the search yourself, you can make sure you're getting best deal you can find. 1. Log on to a side account and locate the item you need via the Shop Wizard, Trading Post, Auction House, etc. 2. Make a note of the shop, trade, auction, or other sales point (copying the URL from your address bar is usually sufficient). 3. Switch back to your main account and purchase the item. 1. Create a new topic with the title 'Quest Help' or 'FFQ Help Needed' (either one of those should get you a fast response). 2. Post the item name in your first message and then wait. 3. In no time at all, a nice, friendly user should have posted the usernames of the shops that item is currently available in. 4. From there just search for that user on Neopets, visit their shop and purchase the item. Once the item is on your main account, visit the Quests Page to give the Fountain Faerie the item. It should look like the image below. How do I get my pet painted after I have completed the quest? Select your color from the drop down menu, and click on the "Get My New Color" button. From there the page should load and give you a nice little picture of your just painted pet. The following colors are colors you cannot obtain through a FFQ: 8-bit, Ice, Magma, MSP, Robot, Royal, Sponge, Quiguki and Usuki. While the rarest of their kind, you should consider yourself very lucky if you receive one of these quests. Once you do, the hard part is over and the easy part begins, buying the item and picking which pet to paint. 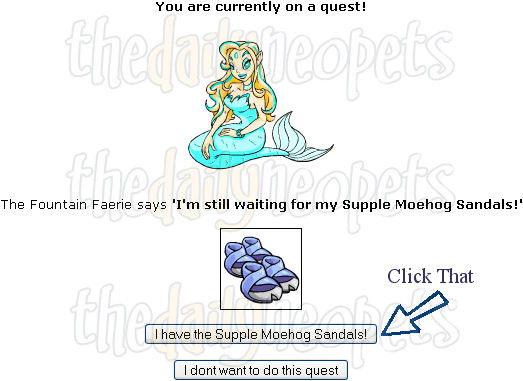 Have fun driving yourself crazy trying to get one of these quests, it would probably be best to just go about your daily Neopets playing and just hope for the best. I would like to thank carrotopian for the use of her awesome screenies! The Snowager is awake. He'll be sleeping in 5 hours, 42 minutes.